Sailing the coastal waters of the Thames Estuary, usually from the base in Maldon, Essex, the nature of working on the water is one of variety, whether the result of the changing tidal pattern each day, the weather or destination. But, the ship has a routine which runs throughout each day with the crew usually working a watch system ensuring everyone gets an opportunity to learn each job whilst on passage. The Trust's approach concentrates on high quality personal support and training with ongoing mentoring, entrenching the development of small groups of students for the long term rather than limiting the experience to time spent aboard. The Trust runs a Youth Sailing Scheme the object of which is to work with small groups of young people residentially at sea for extended periods, enabling them to embed the knowledge gained. Members have an important say in each programme and have also introduced new people to the scheme. Leadership training and sailing accreditation is available as well as the opportunity to develop life skills and build self-confidence. Structured sail training ranges from the Royal Yachting Association’s Competent Crew Certificate to our own Thames Sailing Barge Training Course, which is aimed at those considering maritime careers and wishing to obtain sufficient experience to sail as mate aboard the fleet of Thames barges, which still ply the Thames estuary today. For those working towards their Duke of Edinburgh’s Award we offer the Gold Residential section. 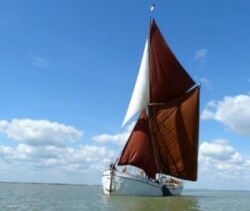 The Trust is undertaking an exciting plan to have built a replica of the sailing barge Blue Mermaid, which will have a steel hull and all the traditional rigging and decking of a sea-going Thames barge. The hull and deck are the work of C Toms & Son Ltd of Polruan with rigging and fitting out at Maldon.